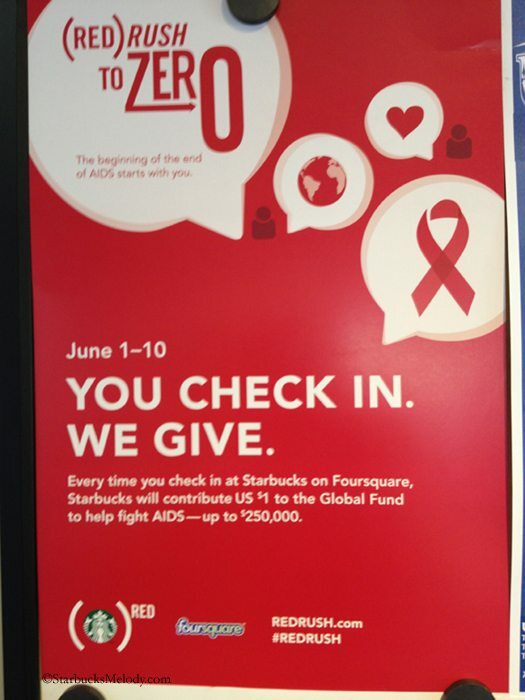 From June 1, 2012, through June 10, 2012, every time you “check in” at Starbucks on Foursquare, Starbucks will donate $1.00 to (Red). They’ll donate a dollar for each Starbucks check in, up to $250,000 dollars. Foursquare is a kind of location-based social media. You use a Foursquare app on your phone to find your location, and then click “check in.” It is important to know that you can check in either privately or publicly. You can broadcast your check in via Twitter or Facebook, or instead check in privately. Only your friends (meaning those whom you have approved to follow you on Foursquare) can see your location. The person who checks in the most frequently at one location is crowned the “Mayor” of that location. I do regularly use Foursquare. I definitely have moments where I wonder if anyone is watching at all, and in any case, my check in stream probably looks pretty boring. It’s a steady stream of locations in Seattle. I will definitely start checking in more consistently starting June 1st! There’s an official website for this promotion here: www.RedRush.com. And you can follow (Red) on twitter, or visit their official JoinRed.com website. There is a little more about the Red Rush on the JoinRed.com blog. Starbucks is just one of many companies that have partnered with (Red) to fight HIV. (Red) is striving for an AIDS-free generation by 2015.
Who is with me? I like this. Check your negativity at the door, please. I know not everyone likes (Red). I do. And it makes sense for Starbucks to partner with them. Starbucks sources coffee from all over the world, and is a global entity. Have fun checking in on Foursquare! An important piece of coffee education: The Coffee Cupping (Starbucks coffees at Roy Street Coffee & Tea). Starbucks Releases Blonde Espresso: Melody Tries It. I guess I have mixed feelings about this promotion. I believe SB should support global and local causes for sure, but am not sure I agree that it has to be connected with foursquare. Also, curious in this short period of time what their expectation is for getting donations? Do they expect to reach their goal? @Purple1 – Please be positive about this. YES, the goal should be very easy to meet. Starbucks has millions and millions of weekly customers so even a small percentage join in, it should work. You can help. Download Foursquare app to your Android or iPhone, and start checking in. Starbucks, especially because of its unique relationship to Africa, should be one to partner with (Red). I this is a smart idea for Starbucks. It supports a cause many support (I know many do not) and is relatively inexpensive for what they’ll get in return. By tying this to social media, think of the free advertising they’ll receive. Melody herself said she’ll be checking in more during that 10 day period. And since Melody’s foursquare account is connected to her Twitter account, her Starbucks activity will be broadcast to the twitterverse. imagine that happening on a much broader scale – hundreds or thousands of foursquare users doing the same and Starbucks has generated quite a conversation about themselves. So besides meeting a charitable goal (red does a lot of work in countries where Starbucks sources their beans), they will gain a great deal of word of mouth and social media advertising. I think this is a great and fun way for Starbucks to do good and get a lot of people to participate. I will definitely pass this info on. I just saw this last night in my local Starbucks! Starbucks has already partnered with Foursquare for multiple other promotions. In my locations, Starbucks are some of the most “checked-into” spots in the city. Thanks for covering this Melody! i think any help (red) can get is great. i’ve had their starbucks cards since the partnership started (and didn’t see a new one for this year??). my views on charities for fighting diseases is a little weird, but (red) seems to actually be making real progress. I don’t understand how anyone could have a problem with this partnership. Starbucks has been helping to support (Red) for quite some time now. While this involves customer participation it does not require the customer to spend anything to help. I should reactivate my Foursquare account for these 10 days. This is one cause that I will not hesitate to chip in. As a Foursquare and Starbucks fan, it will not be that hard, right? @Melody: this has NOTHING to do with what I feel about “RED” of foursq. etc. but, when I read your sentence in this thread about: “check your negativity at the door”, personally I was a little shocked, and taken aback. Wasn’t that a littlerough sounding? I understand it’s your blog and you can say what you want, I’m just letting you know my reaction. That sentence ended my interest in this whole thing. 2)she was sharing her opinion and concerns with you. ??? I don’t want to drag this out any more. You know that I too am certainly a supporter of you and your blog but that doesn’t mean that I necessarily agree with you about everything. I just feel we are all entitled to our opinions and I would hope that you would welcome most of them on your blog, no matter which way they go..barring anything way over the top or obscene, obviously. Denise – I’m writing this in a rush out the door to work. When it comes to (Red), I’ve seen two areas where people get mad at Starbucks. You have seen this too – pages and pages of fighting on MSI about this. The two problems are (1) Why is Starbucks helping Africa? The US comes first and (2) Starbucks isn’t a real charity because it’s not a 501(c)3 organization. Every thread I’ve had about (Red), and as I mentioned I’ve seen this on MSI too, usually has commenters who become upset/angry/disappointed (not sure of the right word) and those fights come up. I guess I didn’t want to repeat that yet again with this (Red) thread. I didn’t mean to come off rough with Purple1. Sorry. We will back to normal threads with the next one, I just was trying to avoid those 2 contentious points about (Red). I am not sure how to respond to the last two comments, but first thank you for your comments Denise. Melody, briefly, I do support SB in their efforts to give to organizations both globally and locally and I thought I said that. Rather than go on and on that is all I will say. Thanks. I think in the original comment purple said that she was unsure of why the (red) promotion was connected with foursquare, not that she had a problem with (red) itself. Starbucks has partnered with them before. I forget what the deal was exactly, but if a customer was the mayor of a store they were entitled to a discount on…I think a Frappuccino? (someone else will remember this better than me) I imagine the success of that promotion brought them to thinking that it would be a good idea to use foursquare again. To me it just seems like a really easy way to raise money for a good cause. As a supporter of this blog I’ve noticed that the comments in the past few posts – particularly the posts about new ideas or equipment or processes have been pretty negative. I imagine Melody is feeling frustrated by that. Add that to what she mentioned about what she’s read here and other places about Starbucks’ support of project (red), I can see why she was trying to be pre-emptive in keeping the comments positive. After all, this promotion is to raise money to help people! On Twitter yesterday the Starbucks profile announced that in April Starbucks partners all over the world contributed 231,000+ hours of volunteering in their local communities. Helping people a little further afield would be excellent too. Starbucks buys coffee from Africa, so it’s part of the Starbucks community too! @anon……. : one cannot put out something to the ‘public’ and expect, or even ‘require’ that the comments be positive. ? Certainly, Melody, can ban or not post anyone she chooses on her own blog but to expect that one must be “positive” to any particular idea…seems unreasonable. I enjoy this blog tremendously, but that doesn’t mean I agree with every ‘idea’, or view of a store. I really always thought the purpose of this blog, within civility of course, was more to put out info and experiences of all things Sbux than to try and get support for any one issue. And certainly, I never thought it was to end all comments that do not necessarily ‘favor’ whatever was posted. That was the good of the whole blog: the very civil, friendly (I thought) back and forth. Some like a push button, some don’t etc. And certainly there are many people who have yrs of memories to add and some who know something newer. and, as far as posting ‘anonymously’, I’m sure there must be a very good reason because otherwise it seems like some of those odd leaderboard usernames that we see on msi, who never post an idea or comment, just vote and end up on that silly board…which I think most of us voted “remove” a few yrs ago. So, I do assume there’s some very good reason why one would post anonymously here…altho I have no idea what it is. And, as far as the ‘recent negative comments’ here? I don’t know. As I said, someone favors the direction Sbux is going, someone doesn’t. ? Isn’t that the whole point? the discussion.? And lastly, as for (red), I have one of the first (prettiest) red cards that came out…which is still one of my registered cards altho the (red) connection has changed, obviously. As far as feeling ‘frustrated’, I’m guessing we all have some of that in our lives, to varying degrees. Personally, I think this is a great idea and addition to Starbucks’ partnership with (RED). I use Foursquare on a daily basis, so I love the idea of my casual check-ins to Starbucks actually benefitting someone/something! A few times lately the discussions have brought me down to read. I felt that way in the thread about the auto-brewers. Yes everyone is allowed to say if they like or don’t like, but sometimes I do feel like, ‘why bother?’ The blog really doesn’t reach >that< many people, and the number of comments is small, and sometimes I do feel like I am excited about changes, but I'm alone in that excitement. I definitely felt that way in the autobrewer thread, and it's happened a couple of times. No, I can't do anything to create only certain kinds of comments on here – you're right. And so it is clear I should have avoided even trying to steer the conversation in any one direction. I do appreciate the discussions, though once in a while, I feel a bit worn out by them. Be sure that you’re following (RED) on Foursquare so you can also unlock the limited-edition (RED)RUSH TO ZERO badge. Carl, I didn’t know about the badge – thank you for the tip! I won’t even comment on RED as I have mixed feelings but will say I admire your drive in posting two to three times a week as I would be exhausted trying to come up with topics and doing the blog! 😉 It is appreciated…and I do get excited about the DRINKS. LOL Bring on more items like the Refreshers or the petites that accompany my cappuccinos so nicely. I will say random questions about SBUX filter through my mind and I cannot wait for your next open thread because I will throw them out there. @Sandra – I guess it has been a while since I’ve done an open thread. Will make a note of that to do that soon. As to blog ideas, I don’t have a store of articles. Rather, I just go with the flow, and as Starbucks does new things, I have new articles. I do really appreciate the times that people tweet me or email tips about tests or good ideas for blog articles. Melody at StarbucksMelody dot com. Again, i think this is a wonderful idea! I can find no reason not to check-in and not to give, though it is indirect. If there is a donation bucket out there I have probably put a buck or two in it. It helps someone and feels good all at the same time. I had been wondering what the results were. Of course, Starbucks was able to meet its goal- and according to @joinred they met it 2 days early! I’m glad I was able to help out in my own way! This is somewhat miserably small promotion compared to the Starbucks (RED) card program which, to my surprise, ended last December and was not renewed by Starbucks. Most baristas were rather unaware of the Product (RED) card and once one cashier thanked me for using it (he had to research the specifics on the program on his own) and wondered why more people were not doing the same. After all, on each purchase, I ended up contributing 5 cents to the RED fund – yes, I contributed, because it’s MY MONEY, not Starbucks money, that is going into the fund (in this shell game you got to follow the money).